Many observers of European Union affairs discard the theory of Realism in the belief that this “crude” theory of sovereignty and conflict cannot grasp the “sophisticated” politics of dialogue and compromise in the EU. However, this rejection is based more on a false stereotypical view of Realism than on the insights generated by real Realism. In consequence, the purpose of this article is two-fold: to debunk the stereotype, and to outline strengths and weaknesses in the Realist research agenda. Malena Britz, Arita Eriksson – The European security and defence policy : a fourth system of European foreign policy? The development of defence activities related to the European Union has been rapid since the end of the Cold War. The creation of the European Defence Agency (EDA) in 2004 might contribute to greater coherence in the Union’s defence related activities. This article investigates the development that has enabled the creation of the EDA and what these developments mean to the study of European foreign policy. 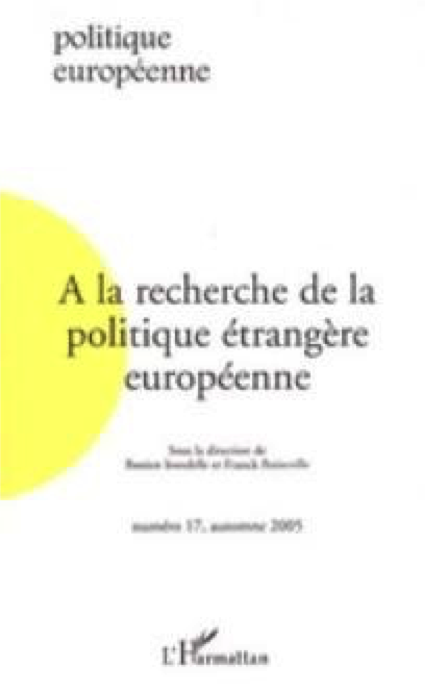 The authors argue - in opposition to Brian White (2001) - that defence should, by 2005, at least be seen as a fourth sub-system of European foreign policy. This article argues that the European Union is no longer a civilian power; instead it finds itself, like almost every other international actor on the planet, somewhere along a spectrum between two ideal-types of civilian and military power. But instead of debating what the European Union is (civilian power or not), we should move beyond this to analyse and debate what the EU does in international relations. The article suggests a few lines of enquiry to open that debate. Clara Portela – Where and why does the EU impose sanctions ? This article explores whether the EU behaves differently as a sanctioning actor towards its geographic vicinity than to regions further afield. It looks at the security relevance of the objectives advanced by sanctions, as well as the interplay between objectives and the geographic proximity of the targets to the EU in its autonomous sanctions practice (1987-2003). It identifies a pattern of geographic differentiation: Eastern Europe has been targeted for the widest variety of reasons, while in the Southern Mediterranean the only focus has been on terrorism. In Asia and Sub-Saharan Africa most sanctions have been geared towards the promotion of democracy and Human Rights. This paper analyses the processes of Europeanisation of foreign policy in EU member and candidate countries and focuses on their comparison through the Greek and Turkish examples. It firstly presents a theoretical framework on the concept of Europeanisation with respect to the foreign policy realm in the EU. 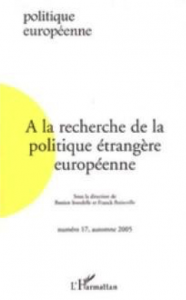 The paper, secondly, differentiates between the Europeanisation processes of foreign policy in EU member and candidate countries, and argues that these two processes can be compared by analysing Greek and Turkish foreign policies towards each other since 1999, when Turkey was declared as a candidate country to the EU. The Turkish and Greek cases are, thus, taken as mirror examples of the Europeanisation processes in EU member and candidate country foreign policies. The paper concludes the result of such a comparison is that these processes in member and candidate countries bear more similarities than differences. Jan Orbie, Hendrik Vos, Liesbeth Taverniers – EU trade policy and a social clause : a question of competences? After describing Europe’s position on a social clause since the seventies, this article highlight the relevance of the competence dimension for explaining Europe’s (in)capacity to export core labour standards through its trade regime. We argue that the vertical integration cleavage in EU politics sheds light on Europe’s evolving stance and on the difficulties to reach a clear and common position on a social clause. The article illustrates how this proposal runs up against the limits of further European integration in both the external trade (trade-related issues) and the internal social (community role in ILO labour standards) domains.